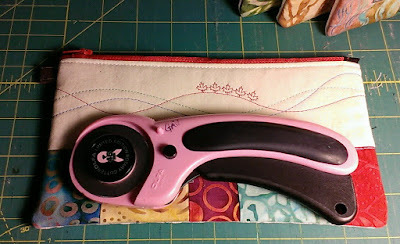 Earlier this week I finished a Row by Row for Diane at Country Crafts and Curtains. This is her third year participating in the Row by Row Experience. This summer's theme is "On The Go". 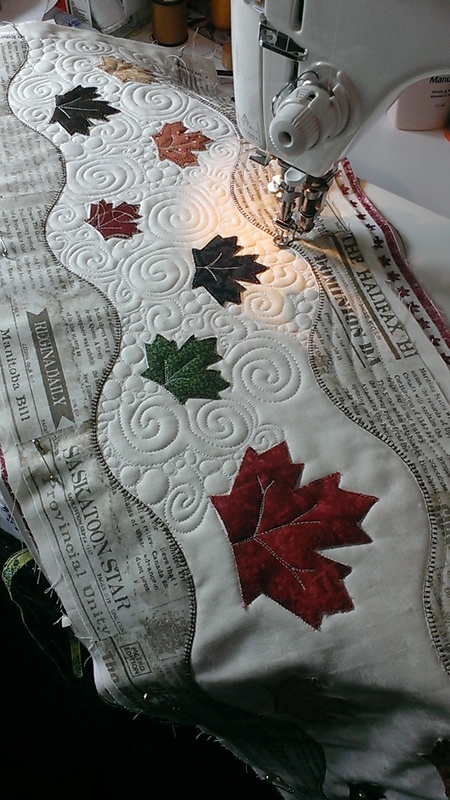 Since it is Canada's 150 year, Diane wanted to incorporate the Canada theme. I took this picture as I was about half done machine quilting the row. 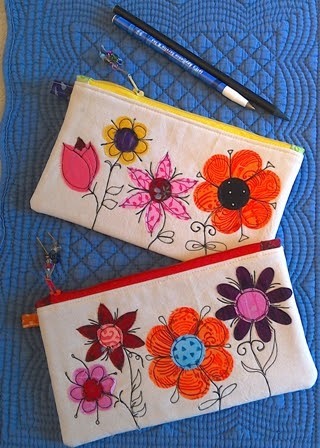 Quilting sure makes a difference, don't you think. 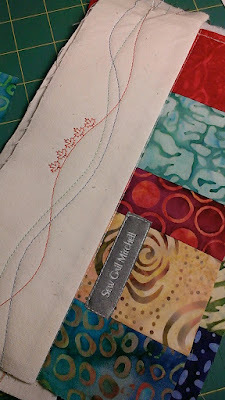 I loved doing this row and I'm looking forward to seeing the row in many RxR quilts. To look at the finished row, read out Diane's blog here..
Well, if you are coming to my house anytime soon, I'll be insisting on serving you tea. Not because I like tea, which I do, but because I want to show off my cute garden tea cozy! 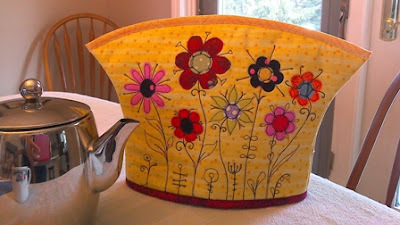 I finished this tea cozy to take as a sample of what what else you can do with the flowers technique in my Secret Garden bag class at Quilt Canada. I know this is an odd shape for a tea cozy, but it fits my favorite Paderno teapot, which is kind of a different shape. More taller than stout if you know what I mean. 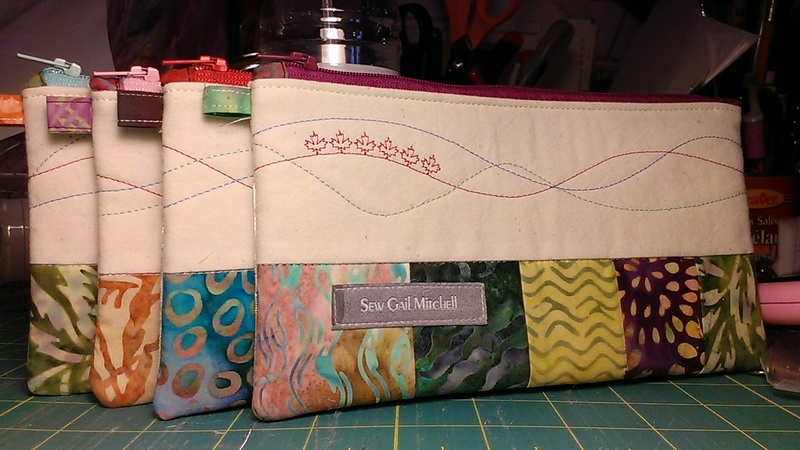 And while I was at it, I made a couple of pouches using the same techniques. You have seen these before. 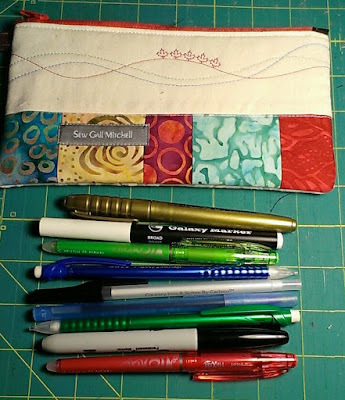 So quick and easy to make using up your colorful scraps. 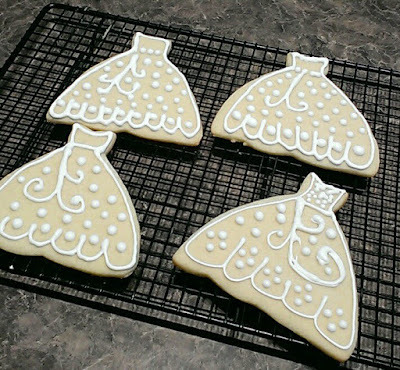 For a family wedding shower this past weekend, I made these cookies without the help of my grandkids. I had fun just the same.. 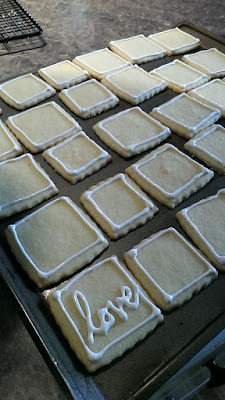 I start out with a great sugar cookie recipe and cut out square cookies. Bake and Cool. 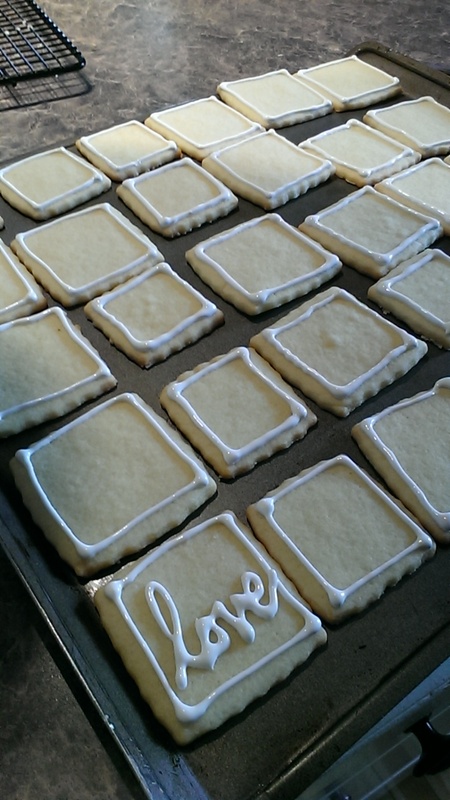 Then using royal icing, I make a square around each cookie. Then add the word love. 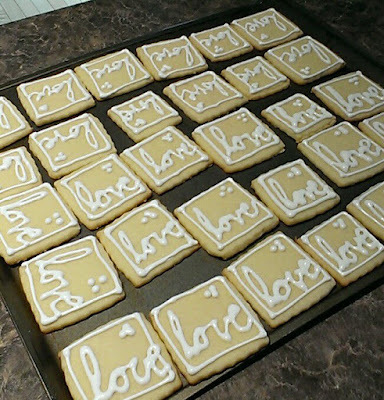 After the first few cookies, the need for perfect lettering fades away. And how about a few wedding dress cookies. These were wrapped these in cello bags so so the bridal party kids could take them home. After the shower, not one cookie left, except for the bride cookies. This weeks rainy weather gave me some extra time in the sewing room. 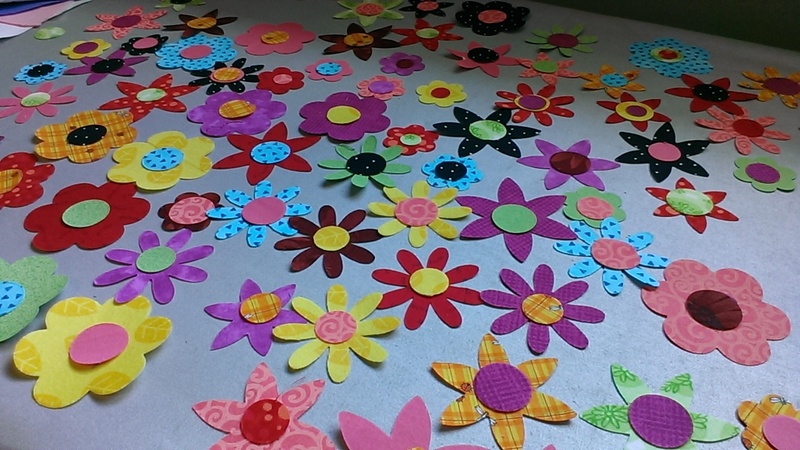 It was a great chance to cut out fusible flowers for a class next month. 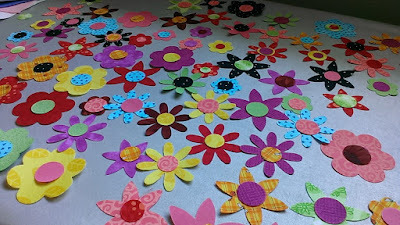 They will be the flowers for the Secret Garden Bag. I'm just itching to make a few class samples using them. Watch for them next week. I'm getting excited about teaching at quilt Canada next month. I'm almost already. I am thinking of all the extra things I might need while away. One thing that came to mind is that I will have classroom assistants for each of my four classes. I'll make little "Canada" themed pouches to use as thank you gifts. 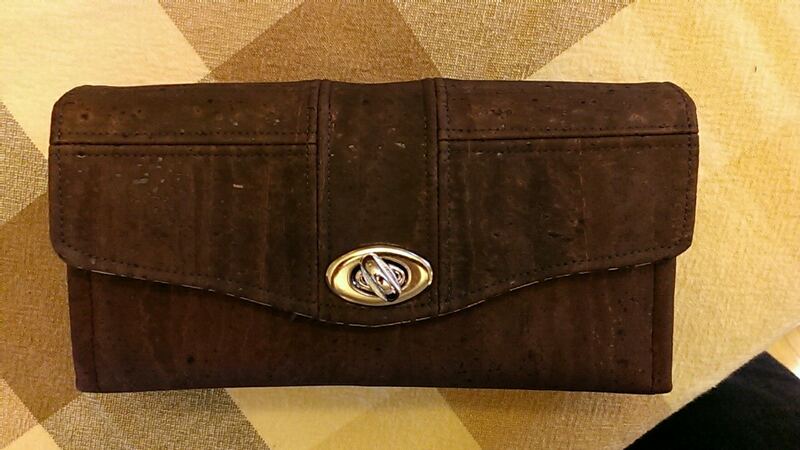 What are these pouches good for, you ask. Well, anything small I guess. 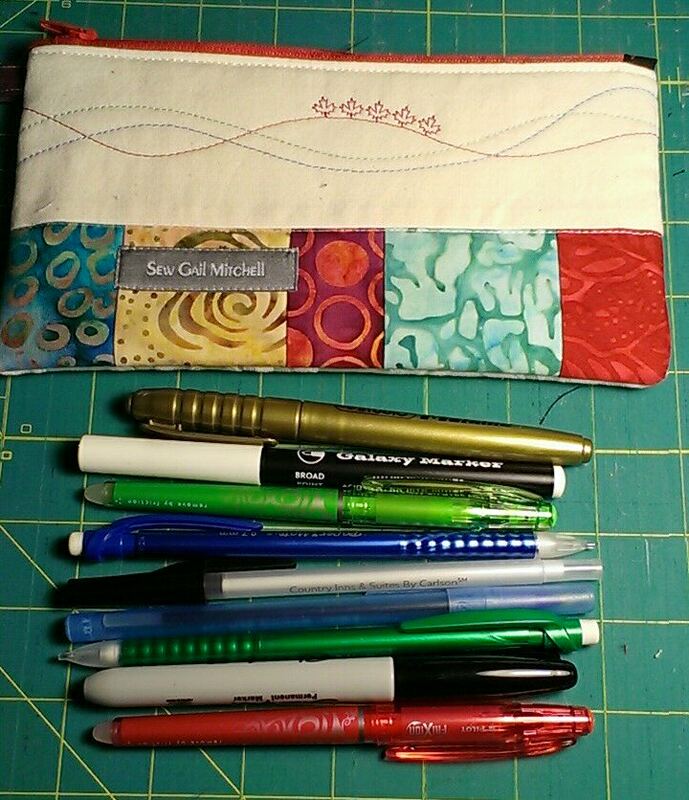 Your rotary cutter, or your good collection of special pens..